District 9 started off documentary-style. Handy cam footages, archive news videos, and interview snippets were used to explain how aliens finally made contact with Earth. However rather than the more superior race, more advanced tech, or war-on-earth stuff we'd been fed with from all the alien films out there, these aliens were malnourished and unable to leave as their mother ship appeared to have broken down. Instead of us fearing for our lives or bowing to them, we had to evacuate them from their ship and provide a refugee-like camp for them in what came to be known as District 9. Fast forward 30 yrs to present day, us human beings being selfish lots decided we'd had enough of them and now wanted them to move out, to go back to wherever they came from because they were now invading our space and our land. As such MNU, an agency tasked with controlling the alien containment, decided to relocate them to a new refugee camp, 240km away from town. A team was sent in to serve out eviction notices and we followed them around the slums of District 9 - hand-held camera style. But of course, there was always a hidden agenda. And things went wrong..terribly wrong. 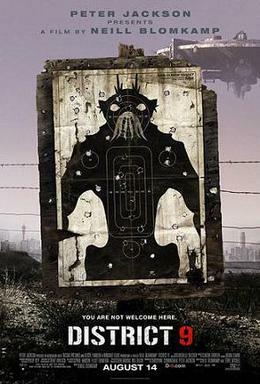 District 9 is one thought provoking film that knows how to stir up our emotions; disbelief, horror, humor, fear, pity, even shame. And it creatively breaks away from the Hollywood-led alien genre where usually major cities are targeted - think New York or Washington D.C. Also the visuals were great. That alien mother ship hovering in the city backdrop looked and felt remarkably real that it kinda scared me. It was so, well so alien. And the aliens themselves were scary too but at the same time it was a lil' funny to see how 'humanized' some of their behaviors were. Sadly toward the end of the film, the documentary framework had to be discarded because it no longer made sense. You couldn't have a cameraman following a wanted man, could you?